Final day and we would be back on Bonsai. A fish and chip night saw the local chippy being swamped with a massive order. A few beers in the bar and an early night for some. Young Ryan was involved in the the 3 man lift, it can be found on Facebook somewhere. This is one of Nathan's party tricks and most new comers fall for it! Ryan was in a position to win the festival yesterday, but he had set up on the wrong peg along with other misdemeanors was awarded 4 points instead of his section win. It was all to play for as a number of anglers could win the festival. An earlier draw today so that people could get away earlier. Peg 67 would be my lot for the day. 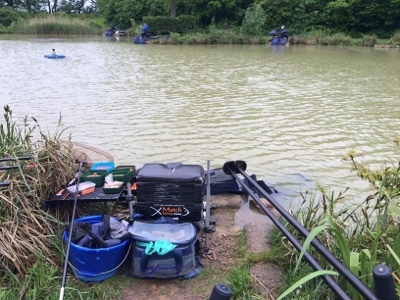 Paul N had won the lake from this peg on Day 1. I had Steve, Juzzy, Young Ryan and Paul N in my section today... a pretty tough section! Again, the spirit of the festival came through with Paul N telling me exactly what he had done on day one, despite being in the same section as me. Thanks mate! Peg 13 on Beeches. A new lake to me both Beeches and Loco were in the draw and the promise of large fish was beckoning today. Peg 13 has a great right hand margin line with around 20 inches of depth and a nice platform for the fish to dine from. Day 3 after a night in the curry house with the lads, luckily I offered to drive so had a very clear head this morning, others didn't fair so well today. Again we would be drawing pegs from both Willows and Laurels, so I could be on the same peg if my unlucky drawing hand pulled it out again. The weather was definitely better, with some wind, causing ripple and it was overcast. Peg 52 Willows would be the home for the day. A peg I've never fished before, so I was looking forward to the challenge. Pretty much open water ahead, with stick-ups to my right which ruled out the margin line. Luckily the left hand margin had been trimmed and was looking tempting. Fish were crashing about spawning to my far left so I set up a method rod to try and get over to them. Top 2 and 2Top 4 and 2 full depth and a shallow rigMargin on the left Bait for the day was a before, fishery pellets and corn. After such a big night after arriving, Monday night was a bit quieter which helped everyone in the morning as there were some fresh faces rather than hung over ones! Today we would be drawing to fish either Willows or Laurels and again tomorrow the draw would be both lakes pegs in the bag. Top 2 + 214 metres at full depth and shallowStick-ups to my right Fishery Pellets, dead reds and corn again as bait. While I was setting up I noticed a lot of activity in the stick ups to my right, so at the all in I decided to put a bait straight in the area. As I was laying the rig in the elastic came out of the pole and a fish was on within 20 seconds of the all-in... thats a first. Day 1 of the festival, it was a late night after arrival at Lindholme Lakes. Almost a full bottle of rum gone in the lodge and some very sore heads. Colin is missing this year and it shows as there is no-one to look after his mate Tony. Tony was looking very sorry for himself.at the draw. Come back Col, all is forgiven! Two discs stuck together coming out of the bag, breaking them apart, peg 46 on Bonsai. No edge line on Peg 46, but I had an island to go at and some open water. The method rod came out and was clipped up to the right hand edge of the island. Pole lines were at 5 metres and 13 metres full depth and shallow. A return to Wold Farm after missing last years MFS match here. My last visit was back in 2013 with my mate Mark when we both had great bags of Orfe fishing shallow. Today's match would be on Oak Lake which is over the back of the complex and a water I'd never seen before. It was an early start to make sure I got to the venue for 9am and luck I set off early. On the M1 I was passing a lot of classic Fords, Mark 1 escorts, Cosworths, Fiesta's and some old Cortina's. I wondered where they were all going? Well the answer was Santa Pod, all on the same road that I was taking to the fishery. Upon arriving at Airfield Road, my last stretch before Wold Farm I was stuck in a queue of, yes, you guessed it, classic Fords, all of which were going to Santa Pod for the day. The last mile took 20 minutes but I made it in time for the draw.